More than 140 students and teachers from 16 school districts across North Carolina gathered at the State Capitol in Raleigh on May 30 to thank legislators for supporting the North Carolina Advanced Placement Partnership (NCAPP) and to advocate for inclusion of AP in the state’s accountability system. The NCAPP, a partnership between the College Board and the state, aims to prepare, inspire, and connect students to postsecondary success and opportunity, with a focus on minority and underrepresented students. To achieve its mission, the NCAPP provides professional development to 115 across districts across the state, with intensive teacher support in a select number of districts. 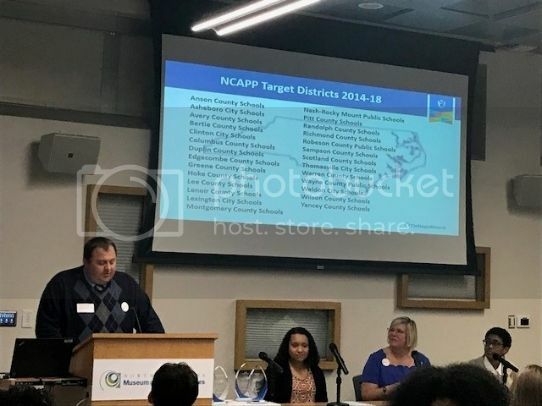 The day kicked off with a breakfast to recognize the NCAPP districts and the three North Carolina 8th Annual AP District Honor Roll districts in attendance: Clinton City Schools, Montgomery County Schools, and Nash-Rocky Mount Public Schools. AP teacher Alan Wooten from Greene Central High School in Greene County helped welcome AP Day participants and highlight NCAPP districts. Kathleen Koch, Director of the NCAPP for the College Board, congratulated Montgomery County Schools for being named to the 8th Annual AP District Honor Roll. Students then broke off into groups to meet with more than 30 members of the North Carolina General Assembly and personally thank them for their support of the NCAPP. Six students from Marcia Chumas’s AP Calculus AB class at East Mecklenburg High School in Charlotte met with Senator Dan Bishop of Mecklenburg County, who spoke about how much he valued AP and the opportunities it’s given to students across the state. The students shared their experiences and why they believe in the importance of advanced coursework like AP. 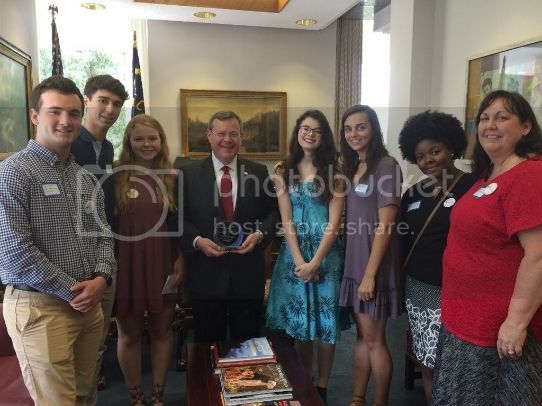 The students from East Mecklenburg also had the opportunity to present North Carolina Speaker of the House Tim Moore with a Policymaker Award for his contributions to the success of the NCAPP. Speaker Moore, who represents Cleveland County, talked about his personal experiences with AP and said that legislators would be looking at how they can further support students and schools by making AP a factor in the state’s accountability model. 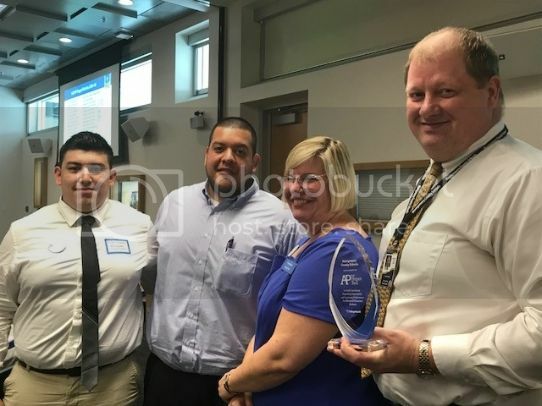 East Mecklenburg High School students honored North Carolina Speaker of the House Tim Moore with a Policymaker Award for his support of the NCAPP. 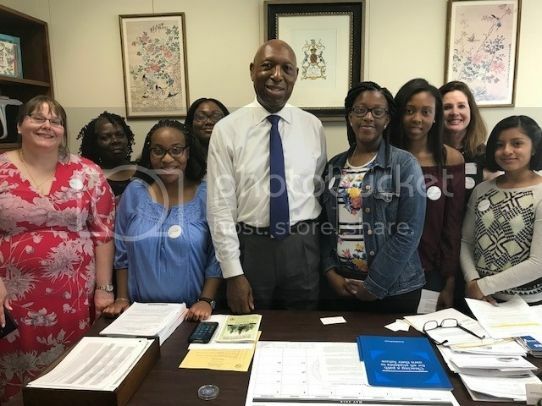 Five rising high school seniors from North Edgecombe High School in Tarboro and their AP U.S. History teacher, Amy Burger, visited with Representative Linda Johnson of Cabarrus County, presenting her with a Policymaker Award. They also had the chance to discuss their AP experiences with Representative Shelly Willingham, who represents Edgecombe and Martin Counties, and Senator Erica Smith. The Assembly members were eager to hear about how the students’ AP U.S. History and AP Biology coursework has prepared them for college. North Edgecombe High School students met with Rep. Shelly Willingham. Over lunch, AP Day participants heard from a panel that included Dr. Maria Pitre-Martin, North Carolina Deputy State Superintendent; Dr. Deborah Reisinger, Assistant Professor of the Practice of Romance Studies at Duke University; and moderator Nicki Griffin, AP European History teacher at South Central High School in Pitt County. The panelists discussed some of the most pressing concerns in education today—including college affordability and how to prepare students for careers in STEM fields—and what role AP can play in addressing those issues. 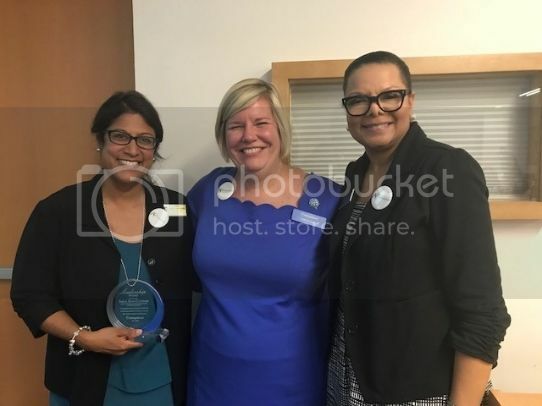 Sneha Shah-Coltrane (left), Director for the Division of Advanced Learning and Gifted Education at the North Carolina Department of Public Instruction, was presented with a Policymaker Award from Dr. Maria Pitre-Martin (right), for her critical role in implementing NCAPP. You can find more photos of North Carolina AP Day by checking out #APDay on Twitter.